The four songs in this picture book are catchy, fun and wildly silly. They are also about things preschool children are often fascinated with and will relate to well - the postman, sheep, traffic lights and the transformation of tadpoles to frogs. The silly humour will hold great appeal for pre-schoolers. In The Silly Postman, the postman starts off by putting a letter in the letterbox on Monday, but on Tuesday he puts in a frog, and then each day after that he puts something just as inappropriate in the letterbox. Tadpole Blues tells the tale of a tadpole’s confusion as he starts to grow legs, and Red Says Stop is a catchy tune about traffic light colours and what they mean. The bold illustrations by Danielle McDonald make every page pop. They are bright with prominent coloured backgrounds. They are uncomplicated with wonderful characterisations, from the hungry sheep with his tongue hanging out to the confused tadpole/frog. 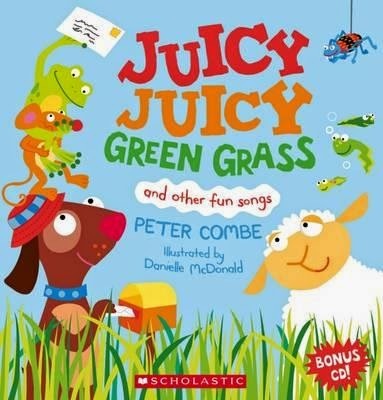 The accompanying CD is performed by the author, Peter Combe, whose timeless songs have been entertaining children for two decades. These are silly ditties about common things and will have everyone singing along instantly.